Geothermal systems occur in many parts of New Zealand. High temperature geothermal fields are principally located in the Taupo Volcanic Zone, with another high temperature field at Ngawha in Northland. Moderate to low and very low temperature systems are more widely scattered. Some are associated with areas of young volcanism: in Northland, Hauraki Plains, and the coastal Bay of Plenty. Many hot springs, particularly in the South Island, are associated with faults and tectonic features. By the 1980s it was believed that all of New Zealand’s high temperature geothermal resources had been identified, a situation that few other countries can claim even today. Of New Zealand’s 129 identified geothermal areas, fourteen are in the 70-140ºC range, seven in the 140-220ºC range and fifteen in the >220ºC range. The Taupo Volcanic Zone extends from White Island in the Bay of Plenty southwest to Mt Ruapehu. Geothermal fields are associated with young and active rhyolitic volcanism. Magma intruded into the stretched and fractured crust of the zone has resulted in temperatures of at least 350ºC at depths of less than 5 km. This has provided a huge heat source from which geothermal systems have developed and been sustained for periods of up to hundreds of thousands of years. A total of 29 geothermal areas have been identified, although only about half of these have potential for resource utilisation. Individual fields are typically about 12 sq km in area and spaced 15 km apart, and include all those in New Zealand that discharge boiling water. An independent company has recently undertaken a comprehensive review of geoscientifc data from the Hauraki region and Taupo Volcanic Zone and is conducting supplementary surveys. This review may have identified new potential geothermal resources that have no surface expression. There is an opportunity to access low temperature geothermal energy (<150°C) in many New Zealand regions, even those without extensive surface geothermal activity. Worldwide direct uses for low temperature geothermal resources are for space heating, bathing, domestic heat pumps, heating greenhouses, and aquaculture. Other more novel applications include snow melting, fog dispersion and de-icing. In New Zealand, GNS Science has a low enthalpy geothermal research programme that seeks to foster more widespread and structured development of low enthalpy geothermal resources. For a description of New Zealand’s low temperature resources, applications, New Zealand examples, geothermal heat pumps, maps, reports and links see the GNS Science web site. The Atiamuri geothermal field is located north of the Waikato River between Atiamuri and Ohakuri and about 40 km north of Taupo. Several hot springs and pools with temperatures up to 73°C are found in this area and two other pools have been submerged by Lake Atiamuri. The two main pools produce dilute chloride water which is used to supply thermal baths. Geothermometer temperatures indicate deep source temperatures of 180 to 200°C. One well has been drilled at Atiamuri, about 1 km southwest of the main pools. The well encountered a maximum temperature of 165°C between 350 m and 600 m depth. There is no known evidence for a high-temperature resource at Atiamuri. The resource may be useful for small-scale direct heat processing of local agricultural or forest products. The field is classified as open to limited development by Environment Waikato subject to the resource consent process. The Horohoro geothermal field is located about 15 km southwest of Rotorua City. The thermal waters of the surface features are very dilute, and geothermometry suggests temperatures of 150 to 160°C in the aquifer. A very large low resistivity anomaly identified to the west of the Horohoro rhyolite dome and extending beneath the Mamaku Plateau is believed to be the result of hydrothermal alteration or to be a conductive ignimbrite. Several shallow wells drilled just south of the Horohoro dome recorded a temperature gradient much lower than that measured in the 600 m deep well in the Matahana Basin. The field is classified as open to development by Environment Waikato subject to the resource consent process. The Kawerau geothermal field is located immediately east of Kawerau township. Most of the surface thermal features are believed to have been in a natural state of decline prior to development, which arose from the energy requirements of the large Tasman pulp and paper processing plant built in the 1950s. Until the commissioning of the Ohaaki power station at Broadlands-Ohaaki, Kawerau was the second largest producing field in New Zealand and its steam supply for industrial use equates to half of the world’s total steam supply for industrial applications. Seventeen wells (including redrills) had been completed by the end of 1957 when Kawerau became the first production field in New Zealand. In the late 1950s four of the wells were deepened following a decline in field production and further drilling commenced in 1966 after continued field decline. The Crown had an active drilling program from the mid-1970s through to mid-1980s, aimed both at maintaining steam supply to the mill and investigating a major expansion for power generation or other process steam supplies. Wells have required frequent cleanouts of calcite scale. New wells have occasionally been drilled to maintain supplies. Until the commissioning of the Ohaaki power station at Broadlands-Ohaaki, Kawerau was the second largest producing field in New Zealand and its steam supply for industrial use equates to half of the worlds total steam supply for industrial applications. The geothermal fluids originate from fractures in the Mesozoic basement rocks, which are overlain by a sequence of layered volcanic lavas, welded ignimbrites, pyroclastic rocks and lacustrine sediments. The permeable zones are commonly hosted by pyroclastic and fractured lava (rhyolite or andesite) units and within the fractured and/or faulted basement greywacke. Downhole temperatures recorded in the field range from 250 to 310°C and a total available resource between 350 MWe and 570 MWe has been estimated. Several different companies draw on the Kawerau geothermal resource, as shown in the figure. There are 24 other monitoring wells. Wells at Kawerau tend to suffer rapid run-down due to mineral deposition and cold water inflow. Various measures are used to maintain output. Production from the field has adversely affected the already declining natural features. The reinjection strategy uses a mix of shallow infield reinjection and deep peripheral field reinjection to the north. However, some waste water from the field is discharged into the Tarawera River after passing through a cooling channel, and current resource consents require ongoing efforts to reduce brine discharge. On the surface, the geothermal fluid is separated to produce steam for electricity generation and process heat steam is supplied to the Norske Skog Tasman, Carter Holt Harvey and SCA Hygiene operations for the purposes of paper drying, timber drying, and power generation. Around 300 tonnes per hour of steam is provided to the Norske Skog Tasman mill where it is used for process heat, electricity generation and timber drying. In addition, Bay of Plenty Energy operate two binary plants rated at a total of 6 MWe which use some of the separated geothermal water as a heat source and generate about 34 GWh/year. These are linked to separator plants physically either side of the Tarawera River. In 2004, Norske Skog Tasman replaced their existing geothermal turbo-alternator with a refurbished ex-US Navy 8 MWe turbo-alternator which generates about 43 GWh/year. From 2004, Mighty River Power began an exploration programme in a new area of the Kawerau field. In 2005, a consent application was lodged by Mighty River Power for the development of a 70-80MW power station. Consents were granted and the 100 MW Kawerau station was subsequently commissioned in August 2008. This was the largest single condensing geothermal turbine in New Zealand’s history until the commissioning of the 140 MW Nga Awa Purua turbine at Rotokawa in 2010. In July 2005 after careful negotiation, the Crown transferred wells, steamfield equipment and contracts to Mighty River Power, who had a back-to-back transfer arrangement with Ngati Tuwharetoa Geothermal Assets. The negotiations involved a balancing of government commitments, Treaty obligations and commercial interests. The transfer marks a change from what has been a caretaking role to a development focus. An independent 8.3 MW binary cycle plant based on the production from well KA24 was also commissioned in September 2008. Ngati Tuwharetoa Geothermal Assets Ltd.
Upstream Developer: Ngati Tuwharetoa Geothermal Assets Ltd. The plant first received steam in 1957; a small geothermal generator was included in the plant in 1966 and was replaced in 2004. Overall the plant receives 300t/h of geothermal steam primarily for process heat purposes. By itself, this plant accounts for almost half of New Zealand’s geothermal direct heat use. This is one of the latest heat plants to be commissioned in New Zealand and means that SCA Hygiene’s heat supply is from an entirely renewable energy source. Future Plans for the Kawerau Geothermal Field : All current and aspiring developers continue to assess the potential for expansion of the Kawerau Geothermal Field. There is strong demand for additional process heat and electricity generation in the region. However, development options at Kawerau are constrained by the need to maintain steam supply to the Tasman processing plant. 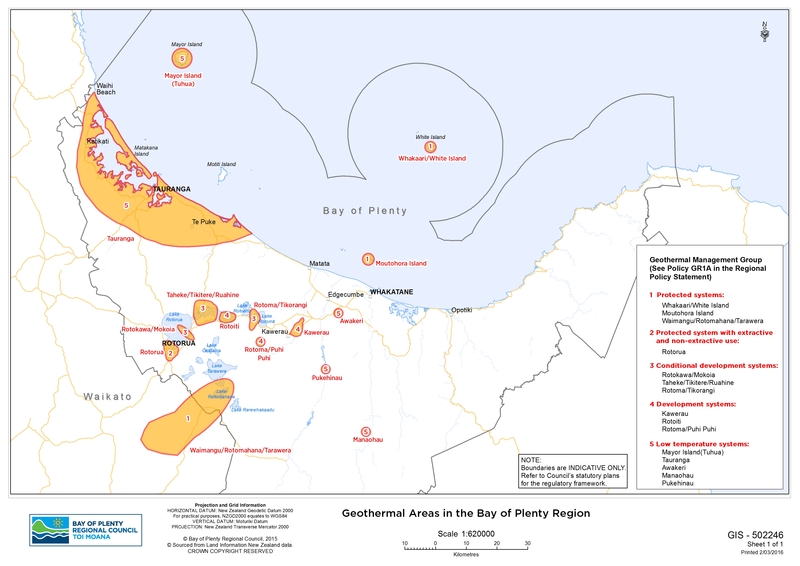 The resource is categorised as a Development Geothermal System by the Bay of Plenty Regional Council and so can be developed subject to consents. The Mangakino geothermal field is located east of Mangakino township. At least one boiling spring was known at Mangakino but is now submerged by Lake Maraetai. Resistivity surveys have identified a low resistivity anomaly. Other investigations have also been carried out, and one well was drilled by the Crown to about 600 m which produced a highly gaseous discharge. The area has been recently investigated by Mighty River Power including 3 new wells, one to 3,192 m depth. The new wells proved formations were relatively impermeable and showed a conductive temperature gradient of about 75°C/km, so that the deepest well reached a temperature of 254°C . Apparently the initial Crown well and the surface spring were connected to a deep upflow. A fresh assessment of potential is needed. The field assessment of potential is needed. The field is classified for development by Environment Waikato. The Mokai geothermal field is located 20 km north of Taupo, remote from geothermal tourist attractions. The field lacks the spectacular thermal activity present at many other fields, consisting only of small areas of steam-heated activity. Geoscience and drilling in the 1980s indicated the Mokai field’s potential. The field has some of the hottest geothermal wells in New Zealand with recorded downhole temperatures of up to 326°C. One well was deemed capable of generating 25 MWe. The high reservoir temperatures mean that wells tend to produce high steam content fluids with high chloride and silica content. The energy potential is estimated at greater than 100 MWe. In 2011 there were 22 wells in total, 11 for production, six for injection and four others. There is a strategy of 100% reinjection though a common injection system for all plants. Fluids are injected at the northern periphery of the field to depths ranging from 500 m to 2400 m.
The figure llustrates the formation details (from Bignall, Rae and Rosenberg 2010). Permeable zones are commonly hosted by ignimbrite and fractured lava (rhyolite or andesite) units, even though basement faults are likely to provide deep structural control on the primary fluid upflow. The Mokai power station was commissioned in 2000 and is the first in New Zealand to be fully owned by a Maori trust (the Tuaropaki Trust which subsequently placed its assets in the Tuaropaki Power Company). Mighty River Power is contracted to operate and maintain the Ormat geothermal combined cycle station which had an initial installed capacity of 55 MWe. Mighty River Power recently bought a 25% share in Tuaropaki Power Company. A 39 MWe expansion of similar design was commissioned in 2005. A further 17 MW binary plant extension was installed at the station in 2007 to take account of the changing steam/water ratios caused by exploitation. Annual generation is about 930 GWh. An 11 ha glasshouse has been developed to utilise the geothermal heat from a dedicated well. A dairy factory supplied with geothermal heat was commissioned in August 2011. Mokai Power Station is the largest merchant power station in New Zealand. Future Plans for Mokai Geothermal Field: Tuaropaki Power Company continues to assess the potential of the Mokai Geothermal Field. They recognise the value associated with steam for direct heating purposes. Experiments have been undertaken to clean up the non-condensable gas flow from the cooling towers so the CO2 can be used in the glasshouse rather than purchasing this externally. The resource is categorised as a Development Geothermal System by the Waikato Regional Council and so can be developed subject to consents. The Ngatamariki geothermal field is located 5km south of Orakeikorako and 17km north-east of Taupo. Compared with other geothermal fields, the Ngatamariki field has few surface thermal features and only a small outflow of geothermal fluid. The surface features that are present are located at the Ngatamariki hot springs where sinter, pools and hot springs are part of a reserve administered by the Department of Conservation. A hydrothermal eruption was reported in 2005. The Ngatamariki Geothermal Development is located within what was the Tahorakuri Forest, and is bordered by farmland to the east and west, and the Waikato River along the northern and southern boundary. Four exploration wells were drilled by the Crown in 1985-86, with four further delineation wells drilled by Mighty River Power from 2008, including one well 3373 m deep. The resource area is estimated between 7 and 12 km2 and the resource temperature ranges from 255°C up to 290°C. The assessed generating capacity is 200 MWe. Ngatamariki’s geology to +200 m RL is dominated by surficial deposits of alluvium, including Orakonui Breccia and Whakapapataringa rhyolite, and lacustrine sediments of the Huka Falls Formation. Underlying the near surface volcanic-sedimentary sequence is crystal-rich tuff and breccias of the regionally-extensive Wairoa Formation, partly welded crystal-lithic Wairakei Ignimbrite, and Akatarewa Ignimbrite and andesite (Tahorakuri Formation). Torlesse greywacke (basement) beneath the andesite layer has been intersected only by NM6 to date. Underlying the andesite lava and breccias in NM4 is a quartz diorite pluton. All fluids will be reinjected back into the field. In 2010 Mighty River Power and Tauhara North No. 2 Trust were granted consent to build a power station and work has started towards construction. The intention is that this should follow, in quick succession, Nga Awa Purua’s construction. Future Plans for the Ngatamariki Geothermal Field : The current contract is for the development of a first stage of development and further use may follow the initial operation. The field is categorised as a Development Geothermal System by Waikato Regional Council and so can be developed subject to consents. The Ngawha geothermal field is located in Northland, 6 km east of Kaikohe and is the only high temperature geothermal field outside the Taupo Volcanic Zone. There are surface expressions of Ngawha’s underground system which includes a number of small fossil sinter deposits, two large areas of hydrothermal clay deposits and about 20 hot springs near Ngawha village. Natural geothermal activity is characterised by the large volume of gas (mainly CO 2) given off over the field. Mercury vapour is also given off, and mercury deposits exist within, and adjacent to, the field. Geothermal investigations at Ngawha began in the 1960s, including the first well. Sixteen other wells were drilled between 1977 and 1983 to depths ranging from 600 to 2300 m. The investigations identified a large, but relatively low enthalpy, resource with the wells producing fluid at 225 to 230°C with high levels of dissolved minerals including boron and mercury. Thirteen of the wells were tested, of which six were good producers with a mean fluid enthalpy of about 975 kJ/kg. Gas ratios suggest that a deeper reservoir at 300 to 320°C is contributing to the system and one well has proved that these temperatures exist. The generating capacity has been assessed as 75 MWe. As of 2011 there were 10 wells in total used in the current development, three for production, five for injection and two others. From its inception, Ngawha was designed and built to facilitate 100% reinjection and refinements have enabled emergency shutdown discharges to also be fully injected. This avoids any discharge of geothermal fluids to catchment. All re-injection wells are at the periphery of field, and have a typical depth of 1 km, while supplementary injection of freshwater is also available to mitigate any potential reservoir pressure decline. The figure shows a geological cross section with the depth of the geothermal reservoir and a typical deep well shown to true vertical scale. There is a large body of almost impermeable rock (claystone, sandstone, mudstone, and limestone often called the “cap rock”, although it does not form a total seal) separating the deep greywacke reservoir from the surface (Lawless 2006). Permeability is fracture-dependent. The current development at Ngawha is a joint venture between local Maori interests and Top Energy which commissioned two 5 MWe binary units in 1998. Resource consents were only granted for a 12 year period on the condition that development should not cause any detectable changes to the surface features which have a high cultural value. Further expansion of the Ngawha project was completed in October 2008 with Top Energy bringing the project up to a total of 25 MWe. Both the geothermal power stations at Ngawha are shown in the Figures. Future Plans for the Ngawha Geothermal Field : Ngawha is a large energy resource with significant investment in unused production wells. The relatively low heat content and the high levels of dissolved minerals in the fluids and high gas content produced from the wells (more than would be produced from a gas-fired power station for the same output) are drawbacks for electricity generation. Of greater concern is the need to protect the surface features. After appropriate monitoring, likely to take about 5 years, consideration will be given to whether any further expansion can occur. The potential for industrial process heat and tourism has been investigated by a number of groups. The field is regulated by Northland Regional Council. The Ohaaki-Broadlands geothermal field is located 20 km northeast of Taupo, immediately south of State Highway 5. The Ohaaki power station, with its conspicuous 105 m high cooling tower, was commissioned in 1989 and is owned by Contact Energy. The station commenced with a capacity of 114 MWe although declining steam production has forced a series of deratings – including decommissioning of one of their high pressure turbines. Steam production has further declined due to cool water from the field margins encroaching on production wells. Output dropped to as low as 30 MWe but an investment programme, including several new wells, initially restored production to the 60 MWe level (550 GWh/year) since late 2007. There have been significant environmental effects at Ohaaki, including subsidence leading to flooding. In 2010 there were 23 production wells which extracted around 1500 t/hr of fluid from a depth of 1.0 to 2.5 km from the Ohaaki area of the field. There are six reinjection wells and the generating capacity has been assessed as 130 MWe – although production constraints limited the 2010 output to 47 MWe. Huka Falls Formation: a mudstone which acts as a cap over much of the field. Ohaaki Rhyolite: this lava has high horizontal permeability and is hydraulically connected to groundwater aquifers. Waiora Formation: the main producing aquifer composed of heterogeneous uncompacted pumice and lapilli tuffs. Lying immediately below the Ohaaki Rhyolite or separated by a thin Huka Falls mudstone layer, it appears to be hydrologically connected to the overlying Ohaaki Rhyolite. Rautawiri Breccia: the second important aquifer composed of coarse breccias. Greywacke: permeability will exist in fractures. 60% of produced fluid is injected, mostly through outfield injection. Much of the balance of fluid is lost through the cooling tower and about 4-5% is fed to a wood drying kiln operation. This then discharges fluid to a previously active surface feature and subsequently the Waikato River. The average fluid production is 36,000 t/day. The following table is taken from Table 2 of Harvey, White, Lawless and Dunstall 2010 – NZ Country Update. Future Plans for Ohaaki Geothermal Field: Current strategies are focussed on maintaining generation from existing assets. The resource is categorised as a Development Geothermal System by Waikato Regional Council and so can be developed subject to consents. The Orakeikorako geothermal field is located about 23 km north of Taupo and 37 km south-southwest of Rotorua City. In 1961 the Waikato River was dammed downstream of the field, creating Lake Ohakuri which flooded most of the surface features, including many of the geysers and sinter deposits. Although the remaining hot springs and pools, geysers, sinter deposits, fumaroles and steaming ground are only part of what was once a spectacular geyser field, the geothermal area remains a significant tourist attraction, and the Artist’s Palette-Golden Fleece area is one of New Zealand’s major geothermal tourist attractions. Temperatures up to 265°C were recorded in holes drilled in the 1960s, but they were poor producers due to low permeability. The energy potential of the field is estimated at 125 MWe, but the field is classified as protected by Environment Waikato. There is possibly a hydrological connection between Orakeikorako and adjacent geothermal fields. Development of these fields would need to consider possible connections with Orakeikorako to ensure that its natural features would not be affected. The Rotokawa geothermal field is located about 14 km northeast of Taupo and 9 km east of Wairakei. The associated thermal area has extensive surface features including fumaroles, eruption craters and collapse pits. Lake Rotokawa fills one crater, and there are large deposits of sulphur surrounding and beneath the lake. The energy potential of Rotokawa was recognised in the early 1950s and drilling has identified a large high-temperature resource of about 18 km 2 with an energy potential assessed as 300 MWe. Production is from around 2.0 to 2.5 km, with temperatures up to 320°C, and fluid is reinjected at depths of 2.5 to 3.1 km. By December 2010 some 30 wells had been drilled at Rotokawa and currently 14 are operating as production wells and five as injection wells. The subsurface geology of the Rotokawa Geothermal Field has been interpreted from drill cuttings and cores. Basement Greywacke is overlain by the Rotokawa Andesite, a sequence of andesite lava flows and breccias up to 2000m thick. Differences in the elevation at which the Basement Greywacke and Rotokawa Andesite are encountered in wells suggest the occurrence of a series of SW-NE striking normal faults, parallel to the structural trend of the Taupo Volcanic Zone, which have resulted in a structural trough (graben) between RK4 and RK6. RK17 is the only well that can be confirmed as having intersected one of these faults. Overlying the Rotokawa Andesite, and infilling the graben, are the volcaniclastic and sedimentary deposits of the Tahorakuri and Waikora formations (members of the Reporoa Group), which are in turn overlain by the Wairakei Ignimbrite. The elevation of the top of this ignimbrite is relatively constant across the field suggesting no, or very little, reactivation of the graben-forming faults since its deposition. Lack of Wairakei Ignimbrite in RK16-RK18 suggests that the ignimbrite ponded against a fault scarp to the east of these wells. Overlying Wairakei Ignimbrite are the rhyolitic tuffs, ashes and breccias of the Waiora Formation. Haparangi Rhyolite lavas and breccias occur within the Waiora Formation, which is then overlain by mudstones, siltstones and sandstones of the Huka Formation intercalated with the Parariki hydrothermal eruption breccias. The 29 MWe Rotokawa power station, an Ormat geothermal combined cycle station, was commissioned in 1997 and subsequently expanded to 35 MWe in 2003. The Rotokawa project is divided into two companies; Rotokawa Joint Venture (a 50:50 joint venture between Tauhara North No.2 Trust and Mighty River Power) which owns the steam field, and Rotokawa Generation (100% Mighty River Power) which owns the generation plant. Mighty River Power operates both the station and the steam field. Annual generation is about 270 GWh. The Mighty River Power/ Tauhara North No 2 partnership also developed the 132 MW Nga Awa Purua power station commissioned in 2010 which, after the initial development at Wairakei, is the largest geothermal power station in New Zealand. It also has the world’s largest single geothermal turbine. Future Plans for the Rotokawa Geothermal Field : The field has a capacity greater than current production and the field response to development is being monitored. The Rotoma field is located about 30 km east of Rotorua and south of Lake Rotoma. Early resistivity surveys outlined areas of interest at Tikorangi and Puhipuhi. In 1985 Fletcher Challenge drilled a 1,500 m deep well in the Tikorangi area. The field is thought to have a reservoir temperature of 220 to 250 °C. Recently the landowner over most of the indicated resource (the Rotoma No 1 Incorporation) has arranged further studies and submitted a consent application for a 35 MWe station, with supplementary use for process heat applications. The Rotorua geothermal field underlies much of Rotorua City and the southern margin of Lake Rotorua. The natural features associated with the field, particularly the geysers and hot springs of Whakarewarewa, are one of New Zealand’s foremost tourist attractions. Whakarewarewa has the largest remaining concentration of geysers in New Zealand. There are also thermal features at Kuirau Park, Government Gardens, Ohinemutu, and Sulphur Point. A hot spring on Mokoia Island, and several warm springs at Lake Rotokawa are probably also associated with the field. More than 900 shallow wells have been drilled at Rotorua to provide hot water for private homes, hospitals, schools, motels, hotels, and other commercial and industrial uses. At peak use, around 430 wells were operating. Currently less than 300 are operating. About 90 of the wells are less than 200 m deep and typically recover geothermal fluid at temperatures of 120 to 200°C. The development of the field has been carried out in an unplanned way and although the domestic, commercial and industrial heating systems that were developed were generally cost-effective, they were also inefficient and were characterised by their wastage of geothermal heat. In the late 1970s there were significant changes to the surface features at Whakarewarewa and there were concerns that this was related to a decline in the geothermal aquifer pressure resulting from the level of draw-off from the Rotorua wells. In 1982 the Government set up a programme to monitor the geothermal reservoir. Initial work under the monitoring programme established that the output from the production wells represented a net withdrawal from the aquifer equivalent to a total mass flow rate of between 30,000 and 35,000 tonnes per day of geothermal fluid. This compared with a natural discharge of around 8000 tonnes per day from Whakarewarewa. In 1985 the then Ministry of Energy published a comprehensive report concluding that there had been a dramatic decrease in natural activity at Whakarewarewa, including a 30% drop in natural heat flow between 1967 and 1985. The Government responded by embarking on a programme of compulsory well closure within 1.5 km of Pohutu Geyser. A field management regime was also put in place. By 1990, less than 150 wells were still operating at Rotorua. Since the completion of the programme, the water level in the main production aquifer has largely recovered and natural features are recovering. Ultimately it may be possible for some alternative use of geothermal energy at Rotorua such as the use of downhole heat exchangers and district heating schemes. The potentially large resource is unlikely to be used for large scale electricity generation because of the effect this would have on the Whakarewarewa geyser field. The resource is regulated by Environment Bay of Plenty. The Tauhara geothermal field is located east of Taupo township and is part of the Wairakei-Tauhara geothermal system. It interacts with the Wairakei system – located 8 km north of Taupo – and the boundary between the systems is placed at the Waikato River. Tauhara has a shallow steam-heated aquifer that underlies part of the Taupo township and land further to the east and north. It has been extensively exploited, with over 400 shallow wells extracting heat or steam or water for domestic, commercial and other uses. Contact Energy commissioned a new 20 MWth process heat supply to Tenon for kiln drying in 2006. More recently Contact has completed the construction of their 23 MW Te Huka power plant which was commissioned in 2010. Since 2002, Contact Energy has had an active drilling programme, with 25 wells drilled for field exploration, production and to carefully assess the subsidence potential. Deep wells drilled at Tauhara have found higher temperatures than Wairakei, adding to the evidence for multiple upflows. The maximum temperature recorded is 279°C. Production temperature is about 250 °C. Other than the domestic use mentioned earlier, Tauhara has two separate major operations: production for power generation and production for industrial heat supply. In 2010 there were three production wells, typically 1.1 km deep, and three injections wells typically 0.4 to 1.2 km deep. The Generating Capacity has been assessed as > 250MWe and recent numerical reservoir simulation have shown that this is sustainable. Tauhara’s formation details are shown in the figure (taken from the Tauhara II consent application). Oruanui Formation and Recent alluvium and tephra – these are relatively shallow strata that can host groundwaters and some hot water tapped by shallow bores in the Taupo township. In 2010 total fluid extraction averaged 18,000 t/d. Future Plans for the Tauhara Geothermal Field : Development must take into account the potential adverse environmental effects on the surrounding Taupo urban area. Contact Energy has been granted a consent (license) to generate up to an additional 250MWe at Tauhara and the project is being progressed to a point that would enable the start of construction once market conditions are favourable. Several shallow wells that discharged steam and hot chloride water have been drilled close to Hell’s Gate and have temperatures estimated at 140 to 190°C. Energy potential of the field has been estimated at greater than 160 MWe, but significant production could affect the natural features of the field. The Tikitere Trust which operates the Hell’s Gate facility is investigating a limited development for electricity generation. The field is regulated by Environment Bay of Plenty. The Tokaanu-Waihi geothermal field is located at the southern end of Lake Taupo about 10 km northwest of Turangi. There are two main areas of thermal activity. At Tokaanu the thermal activity is characterised by chloride hot springs, pools and a geyser. Further west at Hipaua, fumaroles are present on the cliffs above Tokaanu while at Waihi there is an area of steaming ground and acidic springs. Springs occur on the shore of Lake Taupo. Hot chloride springs at Tokaanu and Waihi have long been used for domestic purposes and recreational bathing, but otherwise the field is essentially undeveloped and the subsurface structure and extent of the field is poorly known. High-temperature fluids are believed to exist at depth. A number of shallow holes have been drilled to obtain hot mineral water for the thermal baths and for commercial and domestic heating, and several holes were drilled for site investigations for the Tokaanu Powerhouse and tailrace. At Tokaanu two shallow wells have temperatures of 154°C at 76 m and 169°C at 107 m, and geothermometer temperatures indicate a deep hot fluid of at least 250°C. Decrease in the natural thermal activity at Tokaanu has been related to changes in water levels in Lake Taupo, and also to the effects of shallow wells. Any deep drilling and production could further decrease this activity. Waihi could also be affected. It has been suggested that the chloride waters at Tokaanu are an outflow from the same source as the steam-heated Ketetahi hot springs on Mt Tongariro, and if it is established that the fields are connected, the possible effect of exploitation at Tokaanu-Waihi on the natural features at Tongariro would have to be assessed. Genesis Energy is interested in possible development of the Tokaanu field and has been in ongoing discussion with Ngati Tuwharetoa representatives. The energy potential of the field is estimated at greater than 150 MWe, but development potential remains uncertain. Further development requires the location of the deeper hot water source. The field is classified as open to limited development by Environment Waikato subject to the resource consent process. The Tongariro geothermal field is located on Mt Tongariro and underlies the Ketetahi, Te Mari and Red Crater thermal areas. The field is mainly within the Tongariro National Park except for the Ketetahi area which underlies privately owned land. The Ketetahi hot springs are highly visible and the field is classified as protected by Environment Waikato. The Waimangu-Rotomahana geothermal field is located 22 km southeast of Rotorua. Lake Rotomahana fills the site of the largest craters formed by the 1886 eruption along the Tarawera rift. The site had formerly been occupied by an intensively active geothermal field which included the famous pink and white terraces. The Waimangu field thermal area and the activity at Lake Rotomahana formed after the 1886 eruption. Like Waiotapu, Waimangu has been a major tourist attraction for over one hundred years. Waimangu is unique in the New Zealand setting in that surface geothermal activity began after the 1886 eruption so began in historic times. In the early years a large geyser used to play but ceased many years ago. Thermal activity includes geysers, spouters, hot and boiling pools and streams, mud pools, steaming ground and hydrothermal eruptions. Upwellings of hot water occur within Lake Rotomahana. There is strong geophysical and chemical evidence supporting a connection between Waimangu and Waiotapu. The energy potential of the field exceeds 180 MWe, but the field is classified as protected by Environment Waikato. The Waiotapu geothermal field is located at the northern end of the Reporoa Valley, 23 km south-southeast of Rotorua City. The field has the largest area of surface thermal activity in New Zealand with a variety of features including geysers, large hot pools, small lakes filling craters, extensive sinter deposits, hot streams, mud volcanoes, and altered and steaming ground. Waiotapu has been a major tourist attraction for about one hundred years. Wells drilled in the 1950s and 1980s recorded high temperatures up to 295°C but suffered poor discharge and extensive calcite deposition. Geothermal fluid was used for timber treatment for several years until the well was forced to close when refused a water right on the basis that discharging the well could potentially affect the natural features in the nearby Waimangu field. Limited fluid is still used by Arataki Honey and a hotel for a range of uses. The energy potential of the field is estimated at more than 440 MWe, but the field is classified as protected by Environment Waikato. The Wairakei geothermal field is part of the Wairakei-Tauhara geothermal system and is located 8 km north of Taupo. The boundary between Wairakei and the interconnected Tauhara field is placed at the Waikato River. The Wairakei field is exploited by the Wairakei, Poihipi Road and Wairakei Binary power stations. Initially attention was drawn to the field by extensive surface manifestations including a geyser valley. The field has been extensively developed since the early 1950’s and 50 years of power generation at Wairakei was celebrated in 2008. The Wairakei field is managed by Contact Energy who operate the three generating plants and supply heat for space heating to: a nearby hotel and offices, a freshwater prawn farming operation and to a separate tourism operation. The field has been a consistent and reliable producer, with annual generation averaging 1250 GWh equivalent to a load factor of 93%. Present output is 140 MWe. Sited on the edge of the Wairakei field is the Poihipi Road station which was commissioned in 1996. It has a single condensing steam turbine that was initially fed by four dry steam wells. Developed by a Taupo entrepreneur, it is now owned by Contact Energy and operated as an integral part of the Wairakei facility. Contact has supplemented the initial dry steam supply with flashed steam from other parts of the field. Although the plant has a rated capacity of 55 MWe, its output was initially limited to an average of about 24 MWe. It operated at 29 MWe during the day (when electricity prices were higher), and at 19 MWe overnight. Now that consent and steam supply issues have been addressed, the station typically operates at about 35 to 40 MWe and at full load when the main Wairakei station is shut down. The station currently generates around 350 GWh per year. About half of the steam condensate is reinjected while the remainder is discharged to air through the cooling towers. The Wairakei Binary Cycle power station was commissioned in 2005 and generates an additional 14.4 MWe (128 GWh/year) from the separated water before its reinjection or use by the prawn farm. The original developer of the Poihipi Road station has subsequently attempted developing a further 60 MW station in the vicinity. This second Geotherm station has been successfully consented but the project has yet to progress any further. The Wairakei station is now 50 years old and a replacement plant has been proposed in the Te Mihi area, closer to the centre of production. Although Contact has consents for a 250 MW Te Mihi development as a replacement for Wairakei, it is currently proceeding with a 166 MW development as a partial replacement. At least 150 wells have been drilled in the field and the maximum measured temperature is 271°C, but w ells generally produce fluid at temperatures between 209°C and 261°C. The Wairakei station currently takes 5300 t/h of fluid. Of this about 1500 t/h is steam and 3800 t/h is water from the surface separator at about130° C. Some of the steam is taken directly from shallow (up to 500 m deep) dry steam production wells and piped to the turbines. Separated water from the Wairakei field provides fluids for the Netcor tourist facility, and a heat source for the prawn farm adjacent to the Wairakei power station. Liquid drawdown from the Wairakei reservoir has caused a loss of pressure in the Tauhara field and the formation of steam zones over a large portion of the field, especially in the Karapiti area in which the ‘Craters of the Moon’ thermal area is situated. Other surface effects of this drawdown have been: a decline in the flow of chloride springs, an increase in the extent and temperature of the shallow aquifers and hot ground in Tauhara, the occurrence of a number of shallow hydrothermal eruptions to the northeast of Taupo township. Subsidence has also occurred in an area between the borefield and the Wairakei station, and some local subsidence north of Taupo may be geothermally related. Steam production from the older parts of the Wairakei field has declined but periodic drilling of make-up wells allows steam production to be maintained. Since 1985, the steam zone which formed in the western part of the field as the result of drawdown has been exploited with shallow wells. In 2010 there were 53 production wells and six injection wells and the well depth ranged between 0.3 and 2.4 km. The field’s capacity has been assessed as 510MWe and reservoir modelling shows the currently planned generation is sustainable. About half of the separated water is now reinjected and half is discharged to the Waikato River. All steam condensate is discharged to the river and so overall approximately 30% of total extraction (6000 t/h in 2010) is reinjected, focussed in peripheral parts of the reservoir. The field’s installed capacity currently totals about 220 MWe spread over three power plants: the original 157 MWe station, the 55 MWe Poihipi station and the 15 MWe binary plant that uses 130°C separated geothermal brine. The average 2010 generation was 210 MWe net. The figure shows the fluid flows recorded in 2000. Future Plans for the Wairakei Geothermal Field : Through a call-in process and Board of Inquiry, Contact Energy was granted a consent (license) to generate up to 250MWe at Te Mihi, as an intended replacement for the existing Wairakei station. Construction of the first stage, the 166 MWe Te Mihi power plant, is presently under way and scheduled to be commissioned in 2013. There will be a net 114 MWe increase as some of the existing Wairakei plant will be retired when the new plant is commissioned. Elements of the historic Wairakei station will continue to operate until consents expire, by which time an expanded Te Mihi plant will be operational. The resource is categorised as a Development Geothermal System by Waikato Regional Council and so can be developed subject to consents..